I can't believe where nearly at the holiest and spookiest months with Halloween approaching. 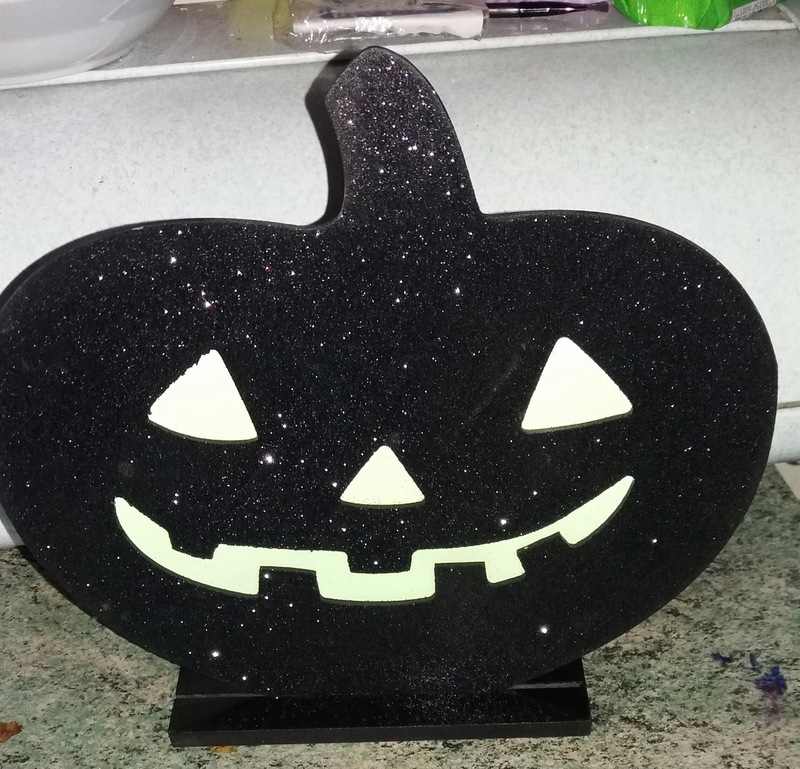 I was hoping to be settled with all my spooky decor up, donning the house but work has meant the date of moving in has been put forward so many times I've stopped making deadlines. I started as early as possible for the UK was late August we're not as enthusiastic about Halloween in comparison to our American counterparts. This year, I was so ecstatic, particularly since I now have somewhere to put it. I've been incredibly disappointed as there aren't as many shops stocking Halloween items and lack of a variety. Personally, I can't understand the reason why as I thought Halloween was becoming popular. Despite my grumblings, I still managed to find a few things. 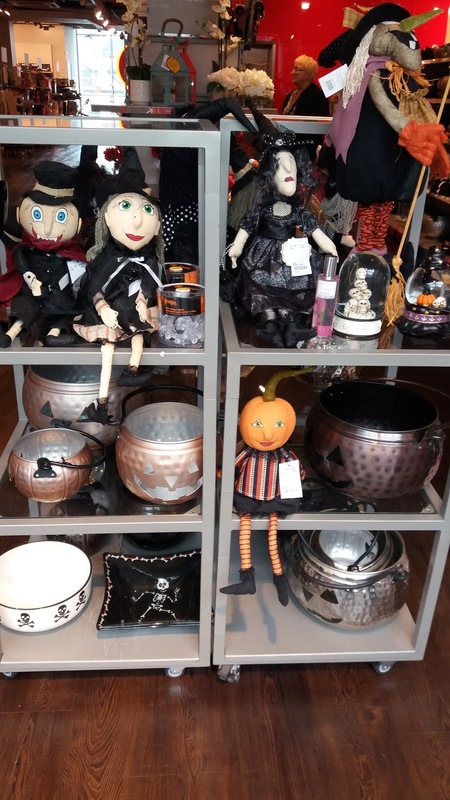 The first place to have the Halloween decor was John Lewis. Where I finally purchase the Vampire and Witch Candle holder, I had my eye on this last year I had limited room. Still, I'm so stoked but unsure where to put it. I bought these zombie ice lollies back in the summer, they made think of my beloved Halloween. They're so fun. 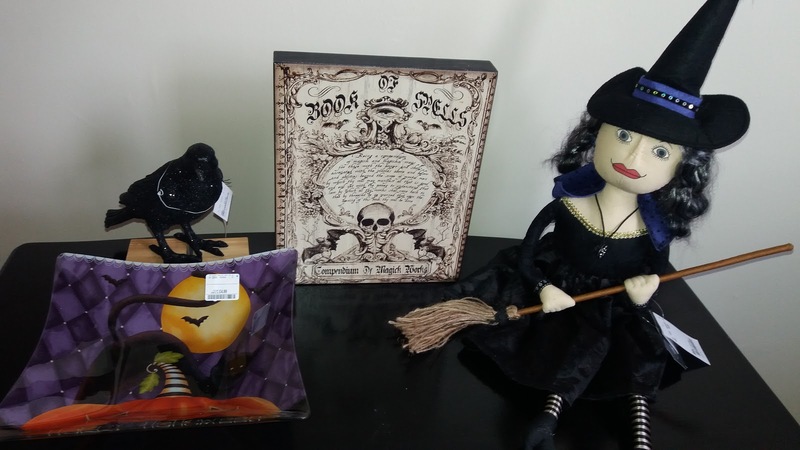 Tk Maxx's home range had Halloween things in from the beginning of September. They stocked thing in drips and drabs and each shop had different a stock. Again, in comparison to last year the range, in my opinion, was far better. I still found a small selection of goodies. I love witches and I found this on to join my ever growing coven. I've got a sparkly a crow; I've always wanted a taxidermist crow that'll do for now. 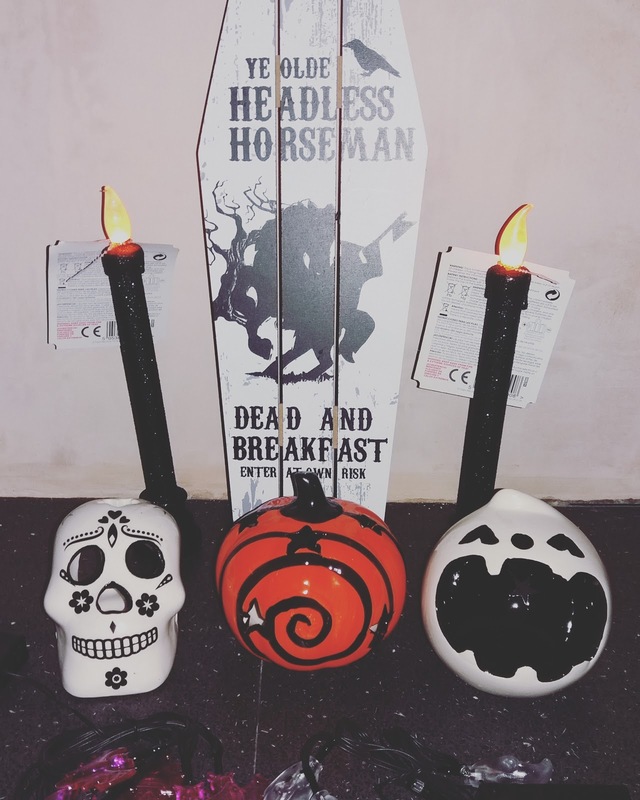 I like the Halloween bowl not sure what I plan for it. A witches sign I'll hang on my walls. 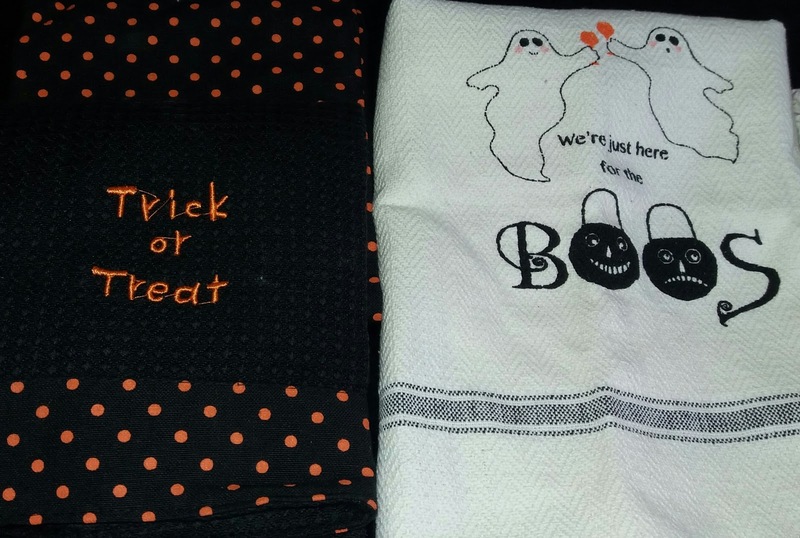 The one thing I've been extremely happy about the is the Home Sense extensive range of Halloween dish clothes and hand towels. Last year, I don't remember seeing hardly anything, so if I stocked up on a few. I think my favourites are the Halloween kitties. 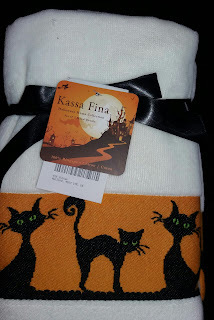 I love my black kitties hand towel, I'm looking to forward to using them in my bathroom. Along with the ones, Sharon aka Goth Gardner sent me. Recently, I've been so disappointed about the stock from Poundland, and they finally got in their amazing goodies in. My favourites are the sparkly candles. 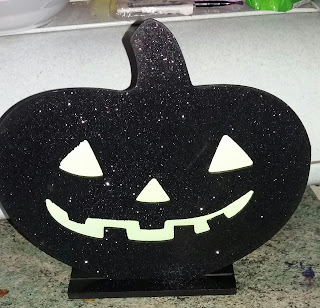 A later find is a wooden black sparkly glitter pumpkin, I love it and I can't wait to put it in the kitchen. Since first seeing these really cute glass jars with straws I've wanted some but found very few that appealed to me. I've been waiting for the Halloween season. Low and behold there is a great selection I got this on from B&M bargains I love it. Apart from their jar glasses, I'm really disappointed by their range. I got these from Poundworld, my usually not keen on skulls. 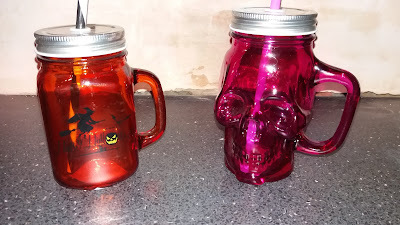 I do love the glass skull cups, and I couldn't resist the luminous pink. I got these from a bargain shop but they seem to stock the same stuff as Poundland. I got these spider candles, liquorice smelling candle, they smell divine. I purchased a small a faux candle with skeletons dancing in the cemetery made me think of Danse Macabre by Camille Saint-Saëns with death summoning his the dead to dance while he plays his violin till dawn. Even Primark had a couple of Halloween goodies, I bought a pair of kiddies hair clips, for £1.50, a black floral headband, I've been debating to purchase but didn't want to pay the price and since it was on sale it finally persuaded me. 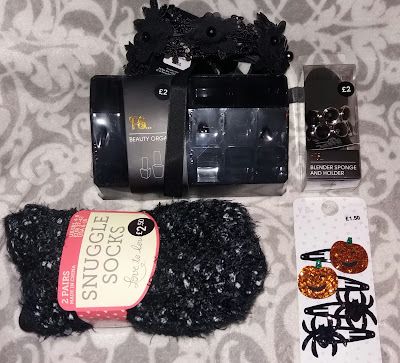 Fluffy black socks since it's getting colder, makeup organiser and a blender sponge and holder. It looks like a prop from Fifty's Shades of Grey. Also, I've been watching various youtube makeup tutorials, and the YouTubers have recommended the blender sponge. So, I wanted to see what all the hype is about and it's black, sparkly it attracted the magpie in me. I even found a couple of Halloween goodies in the thrift shops, normally the stuff I've seen has been in either more costume or just tacky things. 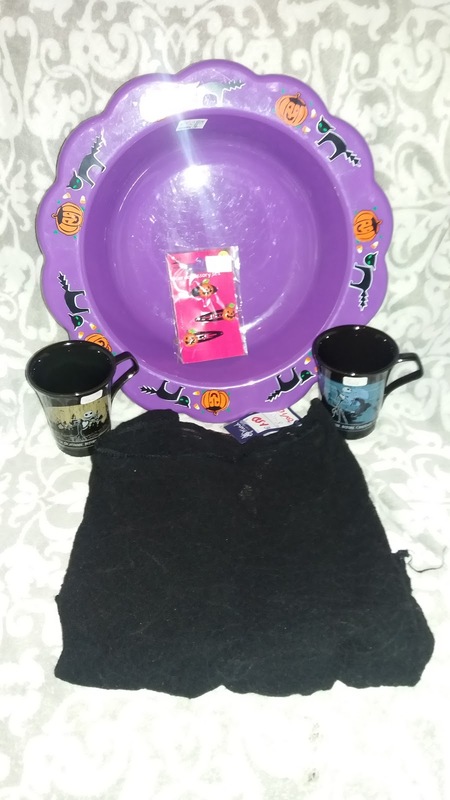 I bought a bowl, Omen spiderweb top and pumpkin hairs clips. 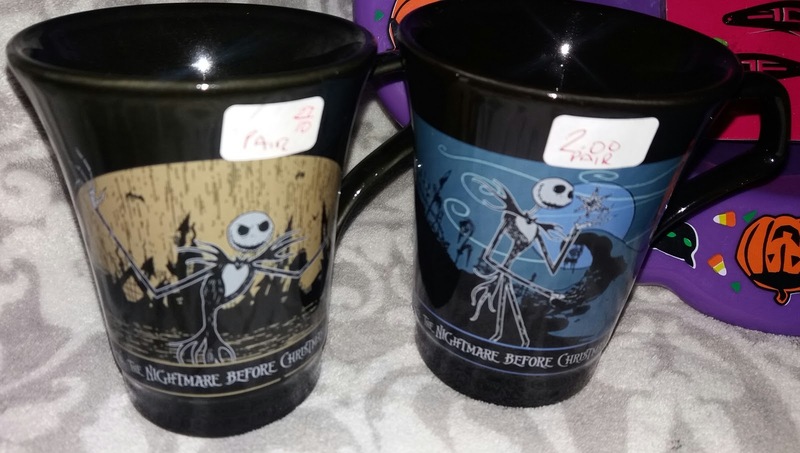 My favourite finds are the Nightmare Before Christmas mugs that, I can add to my ever growing spooky collection of mugs. That will look amazing in my new kitchen. Wow - you have been busy shopping. Great finds. 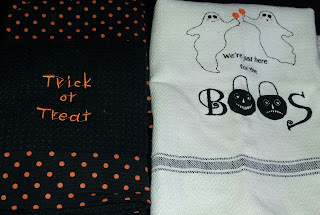 I, of course, covet your dancing skeleton faux candle and your kitty towels. This has been over a few months, but I've been really lucky to find them. I do love the kitty tiles. Thanks.I think I've been lucky to find a couple of things so I should've complain at least I've found a few things. I wanted more house hold things items than anything else. Yes, same here. 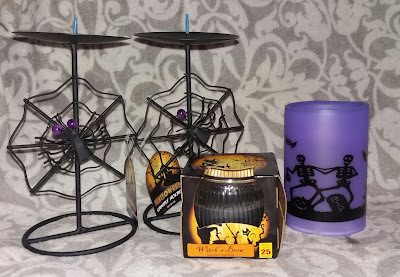 I try not to buy any more Halloween decor, because I have nowhere to put it...but I do love some cool household items. Last year I found a nice spiderweb shaped fruit basket. I like the sound off that. I ended up finding more stuff but that's the last of it.Or I'm going have no place any it. Surprisingly,I have been quite restraint but sometimes I wonder what I would I be like if I lived in the states. Thanks I've seen a couple of your find on your blog and I love them. 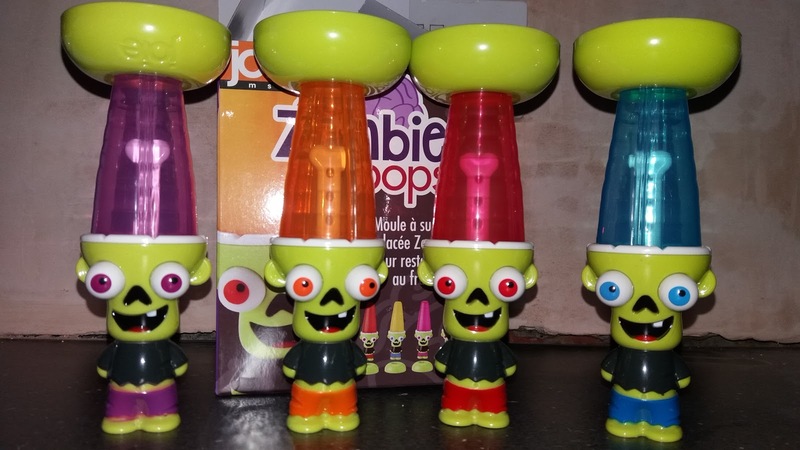 Seems to me you've done very well in your Halloween finds! 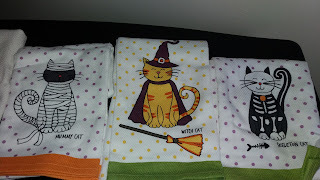 Love those tea towels and hand towels especially. Yeah they were from the Home Sense range in TK Maxx. I'm happy to find more house items. OOH Thanks. I guess I should really count my blessings LOL.For some reason I thought area in Western Europe would of been big on the Halloween. But, I guess it shows you. It's really interesting to know that. Thanks for leaving your blog address I'll be sure to check it out. All of this is so cool! 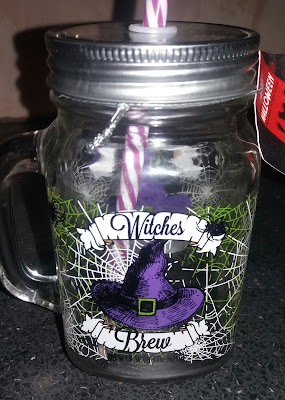 I think your witch's brew cup is even better than what the craft shop here put out this year! Thank you so much for your kind words and hugs on my blog. *hugs* to you too! your post is very interesting and informative for me dear because for the first time i am seeing so much fun stuff related to this festival . Halloween has a lot of negative connotations and it can have a lot positive sides as well. It's all down to perspective. I do like Halloween it's a fun festival.